(Nanowerk News) Measurements at BESSY II have shown how spin filters forming within magnetic sandwiches influence tunnel magnetoresistance – results that can help in designing spintronic components. Research teams from Paris, Madrid and Berlin have observed for the first time how magnetic domains mutually influence one another at interfaces of spintronic components. Using measurements taken at BESSY II, they could demonstrate that what are known as spin filters form between the outer ferromagnetic layers and the inner anti-ferromagnetic insulating layer, influencing tunnel magnetoresistance (TMR). In doing so, the teams enhanced our understanding of processes that are important for future TMR data storage devices and other spintronic components. Their results have now been published in Nature Communications ("Insight into spin transport in oxide heterostructures from interface-resolved magnetic mapping"). Layers of magnetic materials are found in every hard drive and in every read/write head today. These are sandwiches made of complex heterostructures in which the different layers have typical thicknesses of only a few nanometres. An effect of quantum physics called tunnel magnetoresistance (TMR) is critical for their operation. It occurs when two ferromagnetic layers are separated from one another by an insulating layer several plies of atoms thick, like cheese between two slices of bread. As long as the magnetisation in both “slices” is parallel, the electrons can tunnel through the “cheese”, i.e. the device resistance is low. However, if the magnetisation changes in one of the layers, the electrons can no longer tunnel through the middle layer, i.e. the resistance is high. In this way, the electrical resistance can be precisely controlled through the influence of a magnetic field on one of the two outer layers, and be associated with the binary values of zero and one used for calculations. The teams from France, Spain and HZB have now discovered that in such sandwiches combining different transition metal oxides, new interfacial effects can strongly influence the amplitude of the TMR This is what the French team under Manuel Bibes and Agnès Barthelemy of the Unité de Physique, CNRS/Thales, Palaiseau (working in collaboration with the team of Jacobo Santamaria in Madrid) had initially observed in measuring the electron transport characteristics. They were researching a system of two LSMO (La0.7Sr0.3MnO3) layers that were separated by a very thin layer of LFO (LaFeO3). The LSMO layers were ferromagnetic while the LFO insulating layer was anti-ferromagnetic. Measurements using the ALICE chamber and from the XPEEM instrument in beamline UE49 at BESSY II have clearly shown what is happening in the interface between the ferromagnetic layers and the anti-ferromagnetic inner layer. The teams were able to decode how each of the magnetic elements manganese and iron were oriented at the interfaces using the XPEEM instrument. “We saw how new magnetic phases arise at the boundaries that function like spin filters”, explained Sergio Valencia, who heads the HZB team. “Put simply: the iron atoms near the interface are influenced by the manganese magnetic moments; they then orient their magnetic moments antiparallel to those of the manganese atoms and thus form ferromagnetic domains. 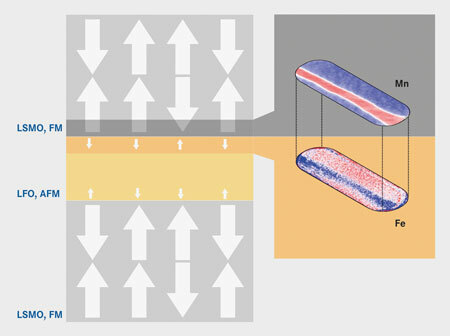 We have thus demonstrated experimentally for the first time that ferromagnetic domains can be induced in non-ferromagnetic barrier layers.” The French team carried out subsequent calculations of how these kinds of spin filters effect the tunnel magnetoresistance and could reproduce the experimental data. “These kinds of complex oxide heterostructures as we investigated here could play an important role in future spintronics”, says Valencia. The results that have now been published in Nature Communications explain an important process that has not been taken into account so far, and they therefore help in designing tunnel barriers with the desired properties.